This time of year, it’s pretty impossible to escape the rhubarb craze. This time of year, it’s pretty impossible to escape the rhubarb craze. As soon as those pink stalks hit the farmers’ markets, everyone with an oven goes to work making muffins and pie. Even meat gets the rhubarb treatment, and suddenly compote becomes a thing we can’t live without. 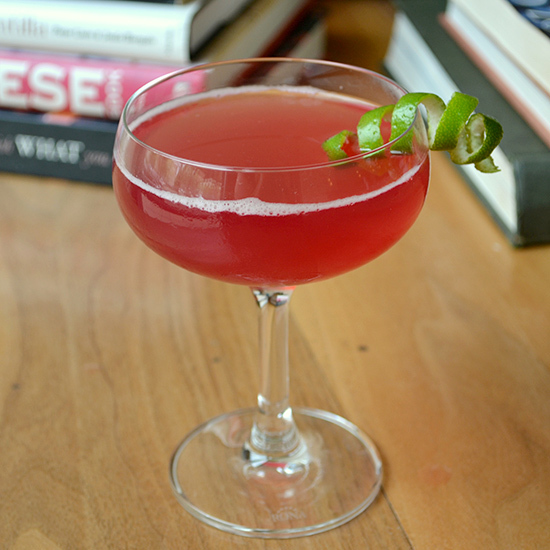 It only makes sense that we should make cocktails with rhubarb, too. At Vera in Chicago (a city that really earned its rhubarb this winter), chef Mark Mendez has created an exceptional rhubarb cocktail in which the ubiquitous stalks find their perfect match—gin. Fill a cocktail shaker with ice and add all of the ingredients. Shake gently until chilled. Strain into a cocktail coupe and serve with a lime twist. In a medium saucepan, combine all of the ingredients. Cook over medium heat, stirring occasionally, until all of the sugar has dissolved. Strain the syrup and refrigerate for up to one week. This recipe makes enough syrup for about 16 cocktails.